It’s been awhile since I moved from DC, but without a place to live and lots of new job stress, I woke up today noting my body didn’t want to be limber and move freely. Lots of sitting since the drive from DC and one untrained-for 10 mile run later, I decided I was stiff as a straight up whiskey shot (what? this is a blog ab out alcohol, not a forum for tired cliches). I decided to go to yoga, and wanted to go to the first yoga place I started at 10 years ago: BKS Iyengar in Minneapolis. By far, my favorite structure of yoga. However, tonight the instructor was controlling and not very tolerant–she kept calling on and picking on an elderly man who had a hard time with the poses. And she equated us to her forth graders. Why we were there then, ostensibly, if not because we were imperfect? The instructor was part Amy Poehler in “Parks and Recreation,” part Kathy Bates in “Misery,” and part bitchy-out-of-this-world “Portlandia” sketch. Can you say B…onarda? One could say she drove me to drink. Or, one could say my great roommate had great pizza that required wine. Whichever reason, I opened a nice, mildly-bold red wine from Mendoza, Agentina (Not just about the Malbecs, okay?) 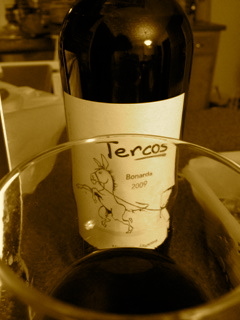 The wine: Tercos, 2009 Bonarda. On the nose, it was fruit forward cherries and black cherries, but not very ripe flavors on the latter. There was smoke-on-leather notes as if lingering cigarette ash in the library, and all that translated to a lovely, balanced taste–again, fruit forward with smoky leather (not overwhelming), with a medium tannin, medium finish and medium acidity that paired nicely with a tomato-rich deep dish pizza. Not perfect, but hell, neither are zen masters these days. I feel like I can appreciate a little rough around the edges tonight more than most. This is a GREAT wine for Monday melancholia. I already had the workout, but for $7.99 (on sale, but still a great price from “Elevated”) I would open this bottle up just to enjoy a glass. Or two. And all the while, strike an imperfect pose and fidget worse than a forth grader. Ole!